UPDATE: This cart has been replaced by Tormach Path Pilot computer and software. The solution is far superior to using Mach3. Path Pilot is as good as production VMC software. The response to input is instantaneous. I picked up a surplus medical cart from www.kpsurplus.com (it's not listed on their website, you will have to contact them directly about purchasing the medical carts), to use it as the computer stand for the CNC milling machine. The cart is perfect, as it already has a built in computer with plenty of power to run Mach3, the height is adjustable using a motor, it's solid and mobile. I had to make a few modifications to it. The first was to remove the privacy filter in front of the screen. This involved removing the back cover of the display, which exposed the computer and LCD screen. The computer appears to be a laptop that was attached to the back of an LCD and enclosed. The motherboard has many ports that are available to use, including a parallel port. Once the back cover of the LCD display is removed, the front cover has to be removed. The front cover is nice, because it completely encloses the LCD, protecting it from spashes, chips, dust, dirt, etc. It's also easy to clean. The privacy filter can be easily peeled off of the screen. Now the screen is visible from any angle. Here's the back of the computer. There are lots of ports available on this computer once the cover is removed. There are even some USB ports open, because most of the USB is connected to a hub under the table top. Turn the cart around, and look underneath the back of the table. Behind this panel is the power supply that provides power to both the computer and the screen. The input to the power supply is 12V from the battery (or a 12V power supply). There is also power provided to a USB hub, which has 8 ports. Remove the panel to expose the power supply, USB Hub, and a rats nest of wires. The medicine storage drawers on the cart are quite handy for tools that need to be kept close at hand. The drawers are locked closed by a magnetic latching solenoid. This is controlled from the computer, and requires login credentials to unlock these drawers (presumably used for medicine storage. If you're not interested in the software unlock, there is access for manual override. Look under the drawers, and you'll see an aluminum plate. There is a small rectangle with 3 tabs attaching it to the rest of the aluminum panel. Snip these tabs, and snap off this aluminum rectangle. Then you'll have to look up into the hole, and find the solenoids with the latch. Pull on the latch, with your finger or a tool, and the soleoid will unlatch, and remain that way. Now the drawers can be opened. The base of the cart has a power supply, which acts as a battery charger, and some custom circuit boards to run the lift, drawers, and other unkown medical stuff. The easiest path to get the computer up and running would probably be to install a 12V lead acid battery. Not having one at hand, I opted to connect a 12V power supply directly to the cable running up the post. In the picture below, the large connector to the left with 4 pins, the RED and BLACK wires provide the + and - 12V to the power supply located under the table top. The BLUE and BROWN wires go to the lift motor that allows you to move the table top up and down. If you ditch the electronics boards in the base, then you need a control system to power the motorized lift. The up/down switch on the back right of the table top is a single pole, double throw, which is not enough connections to be able to reverse the motor direction. You would need a double pole, double throw switch, and run extra wires up the coloumn. We chose to use some relays to switch and reverse the polarity to the motor. David Amis sketched the wiring diagram shown below, and wired it up. It works quite well. These are the specs of the lift motor used on the stand. It's a high end Linak linear actuator. Jelly fish flames wood box. Cigar box which was sanded, engraved, and then coated with wax/orange oil. I only learned later that the discoloration around the engravings can easily be removed with a wet rag. The box was made in 3 separate steps. Engraved the top, rotate 90 degrees, engrave the right side, rotate 180 degrees, and engrave the left side. Unfortunatly, pictures don't do it justice. It looks amazing in person. Other side of the box. Finished the laser cutter project! There are still a few things to add, like the exhaust blower, and air assist. Thanks to David and Greg for help on this project. The stock air assist nozzle left a little to be desired. Being made from a chunk of aluminum, it was heavy, and the barb fitting was straight instead of 90 degrees (which made the air assist tubing stick out too far). The DSP laser controller has an input for the autofocus sensor. I thought it would be handy to have the autofocus sensor integrated into the nozzle. The nozzle shown below is the result of these design requirements. It has a spring loaded tip. 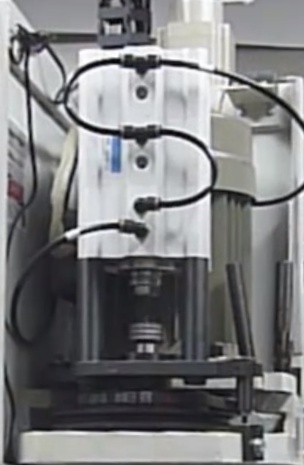 When the table is raised, and the part touches the tip, the electrical contacts inside the tip are lost, and the DSP autofocus input is triggered. The table then lowers a specified distance away from the tip to achieve proper focal distance.